Corporate Social Responsibility isn’t about giving money away and adopting the latest cause of activists. 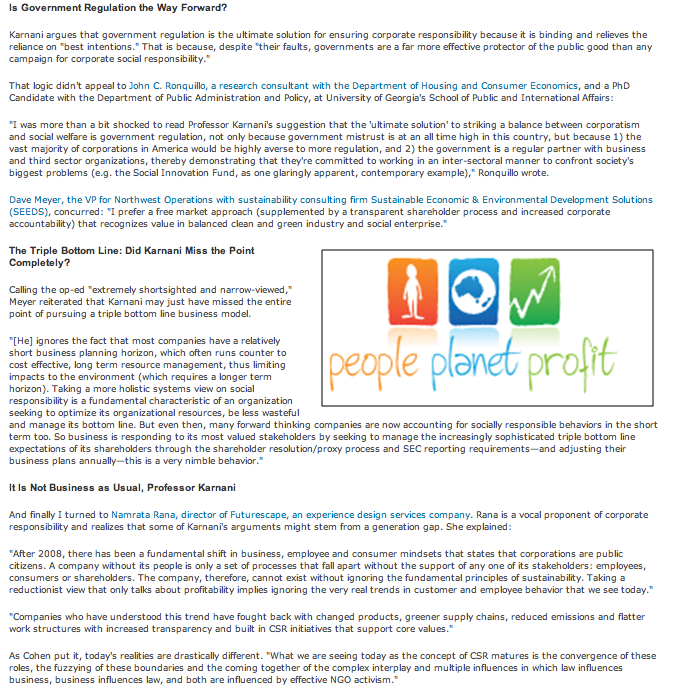 CSR and sustainability are approaches to business operation and execution that build employee engagement, improve environmental performance, create positive social impact, enable operational efficiency, reduce cost, foster innovation, strengthen relationships with customers and consumers and ultimately…create business advantage. Despite numerous debates [Fenton’s BIG CSR debate] and as many editorials and reports [Why There Is a Case for Corporate Social Responsibility], the inequity of the idea — or the perception that being responsible will cost a company money and therefore is an expense business doesn’t need — prevails. But the actual essence of this debate no one can seem to pinpoint. Are we fighting over semantics or strategy? 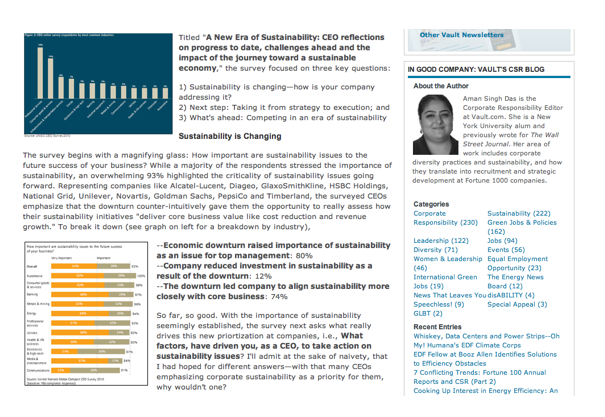 Is it the misperception that CSR is a cost, a tagged on responsibility, and therefore, unnecessary for companies? Or that CSR is completely estranged from the notions of capitalism as Professor Karnani believes — and is, in fact, the wrong argument? Now, the associate professor of management and strategy for Michigan’s Ross School of Business is headed to New York City to debate his argument in real-time on the occasion of the CR COMMIT! 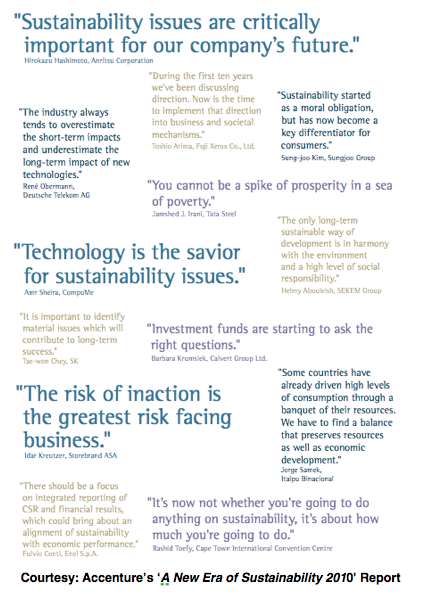 Forum 2011, organized by Corporate Responsibility Magazine and NYSE Euronext [Details below]. Fashioned as an Oxford-style debate [DEBATE: RESOLVED that when companies expend resources on corporate responsibility and sustainability they destroy economic value], Karnani will be joined by Gerry Sullivan, president of the VICE fund, on the pro-markets side. On the pro-sustainability side will be Paul Herman, CEO of HIP Investor and Dr. Vinay Nair, founding partner of Ada Investments and adjunct associate professor of finance and economics at Columbia Business School. In a sneak peek, I talked to three of the debaters [Dr. Nair couldn’t make it] on the essence of their arguments as well as: How does each of them define CSR? Gerry Sullivan from VICE funds believes in the power of capitalism. His funds select well performing stocks of tobacco, alcohol, gaming and weapons companies because they believe that, “Vice industries tend to thrive regardless of the economy as a whole.” Anyone reminded of the root of the financial collapse? “I believe in capitalism because it ensures that products and services coming out are tested on the profit mandate and ultimately are good processes because they come through the interaction and the ability to gain profit,” he said. Fair enough. Historically, companies who do well tend to share more. Making Too Much of CSR? 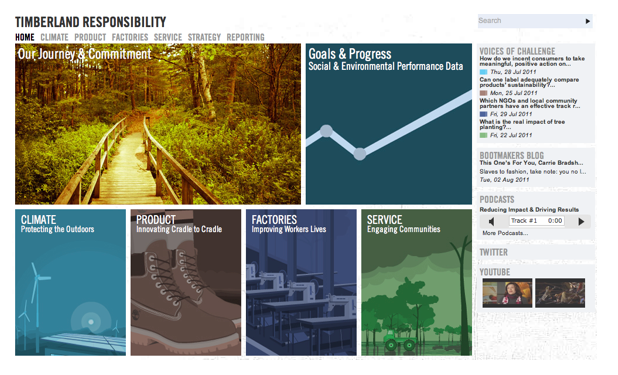 “My biggest fear of CSR is that people want to make more of it than it really is. A company’s ability to employ better people and deploy profits is the real goal. Everything else is settled by the market,” he continued. But clearly there is a differentiator between companies that invest in their community and immediate environment over the long-term and those that focus on short-term yields? Further, “Research from Wharton School and other academics has shown measurably that companies that help solve social and environmental problems can enjoy a higher shareholder and portfolio value,” he said. “This decreases risk for business and increases value,” he added. Because it had begun to sound like a battle between two followers of capitalism with opposite operational ideologies, I asked Karnani to step in. “Companies can maximize profits and social enterprise at the same time, which is why capitalism works well. This is where Paul makes a good argument. Of course companies should do all this,” he said. “But we don’t need CSR to make this argument. It’s as simple as ‘make the money, help employees.’” he added. Here is where the caveat comes in however, he said. “This isn’t always true. When markets fail, we cannot appeal to companies to sacrifice profits for CSR and it is naive of anyone to think that all the stakeholders are always aligned in their interests. If this were true, we wouldn’t need the study of economics,” he argued. His solution? Going back to what he had argued in the WSJ editorial last year: Government regulation. And this is where my problem with the debate starts: How can government regulate behavioral change, cultural perceptions, and a deteriorating environment? Or are we now talking of CSR as a program, an initiative, a fundraising for charity opportunity? If so, was Karnani suggesting the route the Indian government took recently by “mandating 2.5% of net operating profits must be spent on CSR” by all publicly traded companies? Perhaps, although we won’t know till the live debate at the COMMIT! Forum. Back to Square One: What the heck is CSR? Clearly, the next question: How are these men defining corporate social responsibility? Intentionally or not, I had hit the nail on its head. “I would like the companies I invest in to not be socially responsible but responsible to their shareholders and producing products that the government can use to generate revenue. I certainly hope that these companies think highly of their employees but I’m less inclined to think that they would give up profits over socially responsible activities. The argument, at least for Herman, isn’t about the validity of CSR anymore. “It’s about generating top-line growth and bottom-line profits. That’s why employees and investor relations teams are key in solving this paradigm,” he concluded. 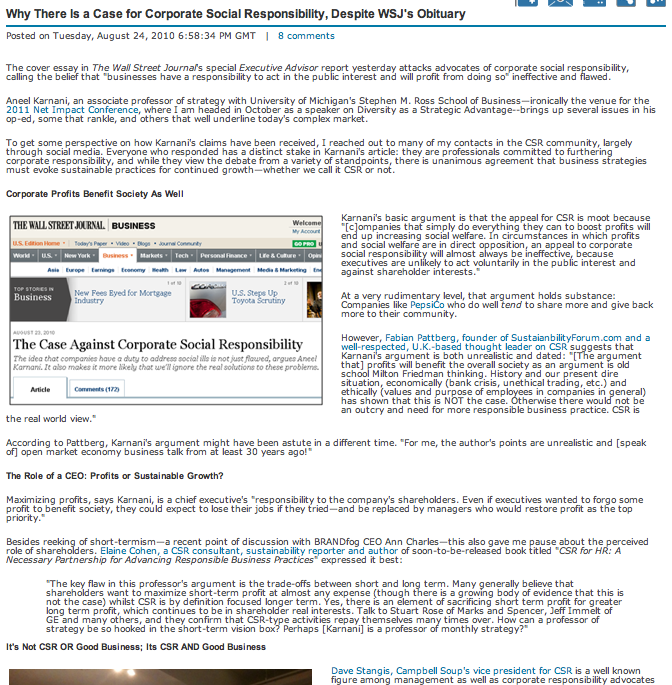 “CSR is a very confused notion. If you just mean businesses doing good for society, then capitalism is actually good [for society]. If CSR goes beyond ‘making money,’ then it’s not about ‘making money.’ When a company does something socially useful and loses money over it, that’s CSR. And definitionally, CSR loses money,” he concluded. Want to attend the COMMIT!Forum? Register here or connect with me on Twitter @AmanSinghCSR for a special discount code. The Forum begins on September 26, 2011, at the Javits Center in New York City and offers a full two-day agenda complete with a CSR careers symposium, keynotes and workshops. And if you cannot make it, stay tuned here for more coverage.